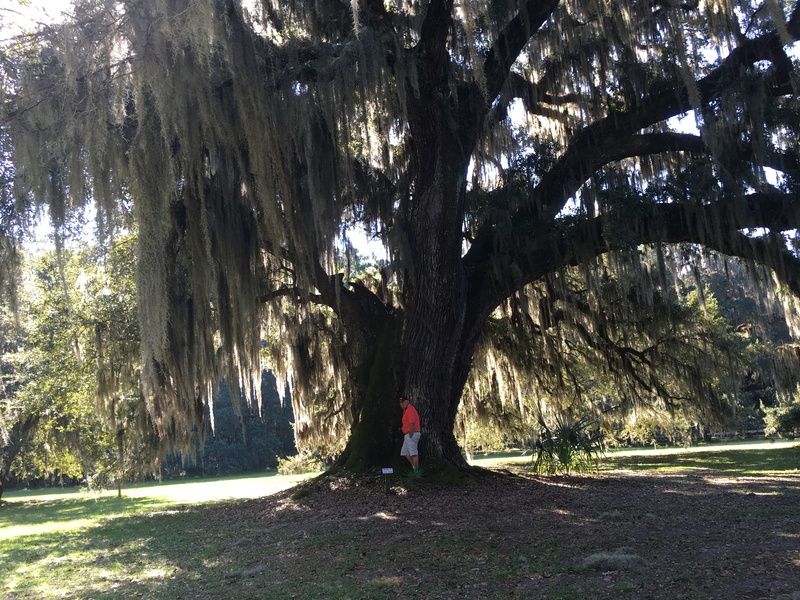 Brunswick Ga – Let's Go RVing! 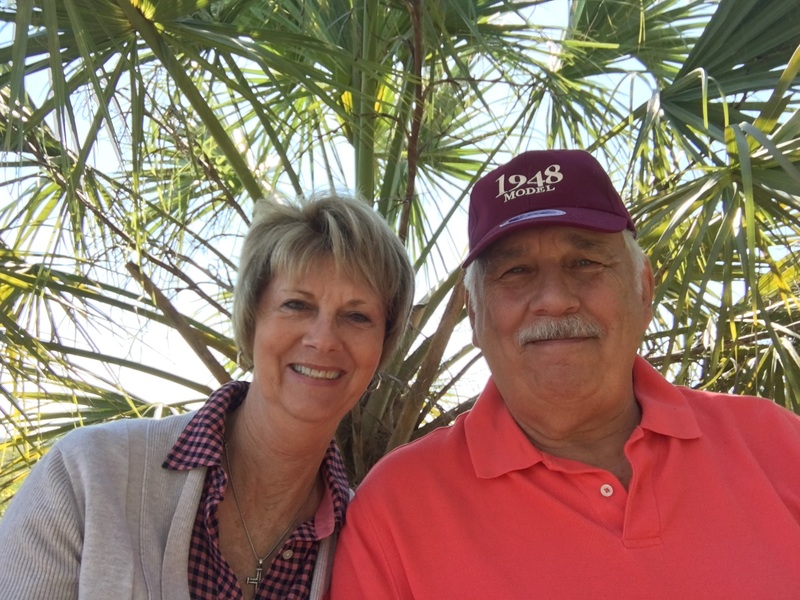 Are we brand new RVers? Did we start just yesterday? One would think so! We left at 8:42 and two hours later we stopped for gas at a Pilot station at Port Wentworth, Ga. Pilots are RV friendly but I think that’s more for diesels than gas coaches. We got in to a pump and getting gas was no problem at all however leaving was another story! Apparently Jerry pulled too close to the pump so as we were leaving he suddenly stopped and told me to go check the tow dolly. Well, the tire of the dolly was up about six inches on the cement barrier. Jerry got out and started directing me to pull up, back up, pull up, etc. He finally realized that the only solution was to take the car off of the dolly. So while other RVers were riding through and looking there we were right in the middle of the Pilot station taking the car off of the dolly. Since we were only about 86 miles from our destination I told Jerry that I would just drive the car on but he wanted to put it back on the dolly and he did. I know we got some strange and pitiful looks from passersby. Was that the end of our misadventures? Oh no! We arrived at Coastal Georgia RV Campground with no difficulty and very quickly got into a nice cemented pad. We set up, put the jacks down and brought the slides out quickly. As Jerry was finishing outside I got out the lunch preparations and then walked outside to see what he was doing. He was just before taking the car off of the dolly so I said I’d do it. I got in the car, started to back up and kerplunk – Jerry had forgotten to put the right ramp on. Oh my gosh – what to do? Last week Jerry had gone out to a mill and gotten some scrap wood and decided to bring it on our trip as it would make good firewood. Thank goodness. I’m not sure what he did because I was in the car but I think he was stacking pieces of wood until it got high enough for me to drive up. He kept telling me to drive up, drive back, etc. until I got it back in place and he could put the ramp on. Honestly we have never had such difficulty or done such bone headed things. We have always said we learn something every trip. Let’s hope we have learned enough for this trip. After lunch Jerry laid down for a while. I think he was just exhausted both mentally and physically. About 3:00 we took off for Jekyll Island. We had visited the island nearly fifteen years ago and believe it or not little has changed. We saw a number of places that we remembered visiting on our earlier trip. We rode completely around the island and then turned around and start retracing our steps.Along the way we stopped at a parking place ad walked down to the beach. It was very calm and the tide was out. In fact, it looked more like a lake than an ocean but Jerry said it was just as he remembered it. We stopped at the ruins of William Horton’s house. It is one of the oldest tabby buildings in Georgia, and the site is listed on the National Register of Historic Places. Tabby houses are made from concrete made by burning oyster shells to create lime, then mixing it with water, sand, ash and broken oyster shells. Next we wandered around some of the shops. 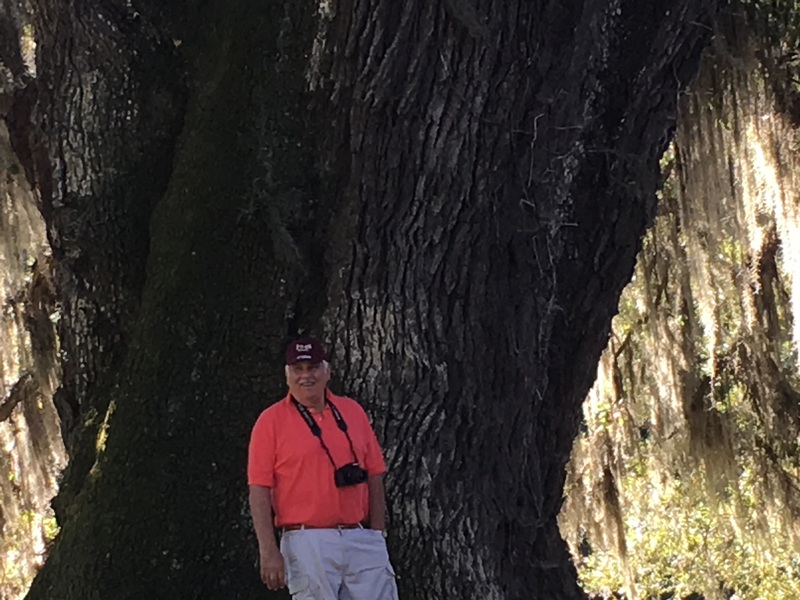 I bought the usual magnet for Jekyll Island and then we walked around and took some pictures of the scenery. Jerry wants to try to draw some of them. By this time Jerry was getting a bit tired so we headed back to the campground. We stopped at a Winn Dixie on the way back and picked up salad ingredients plus a steak to grill tomorrow night. When we got back to the motor home I sat outside for a while and read. Jerry joined me for a short while and then we came in and had dinner. After dinner we took a short walk around the grounds. We hardly saw anyone. In fact, it was a bit weird. We could see the coaches with lights on but no apparent people in them but no one outside. I have no idea where everyone was. I told Jerry it was like the Rapture had occurred and we got left behind. It is an extremely quiet campground and I haven’t seen a single child. It is not a 55+ campground but one would think so. Plans tomorrow are to visit St. Simon’s and Brunswick and then head to Bradenton on Sunday where we will stay until the 27th.